North Carolina American Shorthair Rescue View other American Shorthairs for adoption. Say Hi Garfield! 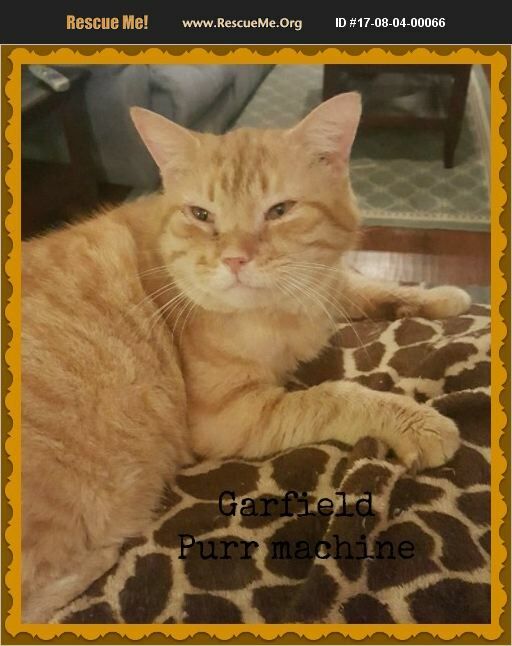 This is one mellow, lovey, gentle, affectionate kitty.Garfield has a squinty look all the time because he purrs all the time and loves to knead away. He is doing that in this picture. He loves his family, enjoys spending time with them as that is the nature of the orange ginger tabbies. They bond well with their humans, are great sleepy and lap kitties. I personally always have a male ginger. Garfield will steal your heart away, his personality is great. He is not super playful, loves the feather on a pole and to watch the birds. We offer a 2 week trial adoption to make sure Garfield is a great kitty for your family. We also have 6 kitties on display 7 days a week at 5401 South blvd, in Charlotte, NC. We try to respond in less than 24 hrs. Search Snow Camp on rescue me.org to see all of our kitties. Thank you for your interest in our beautiful rescue kitty!